Objective: To operate on the body without drinking. Supplies: An Operation game and alcohol of choice. 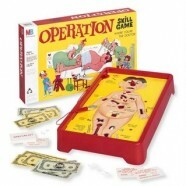 Directions: Play the game of "Operation" by its normal rules, but instead of playing with money, you play with drinks. For example, your job is to remove the silly bone for $400. If you do it, you distribute 4 drinks to any player/players. If you mess up and set off the patient's nose, then you take 4 drinks.